First it was surrogate birth mothers, and now it's Necronites, surrogates for death. Jesse Sullivan is one of these, at the moment of another person's death, she can re-focus his or her life energy, keeping him or her alive while she 'takes' the death. After her body heals from the death injuries, her brain re-boots and she is once again alive. Every one needs a job, and Jesse is well equipped for this one. Not every one is happy with the Necronites, specially the church. It is possible there are connected with the questionable events surrounding Jesse's latest job. I found this a creepy and fascinating idea that someone else could take my death. I could have finished it in one sitting except for family obligations. It's hard to know in this story who is dead, who should be dead and who could become undead. This makes for great plot twist possibilities. Brinkley, her handler, Ally, her assistant, and her boyfriend Lane are great additions to the story line. They are very different from each other and help to bring out the various sides of Jesse's personalities. I look forward to reading more of Jesse's story in Dying by the Hour and then in Dying for Her. 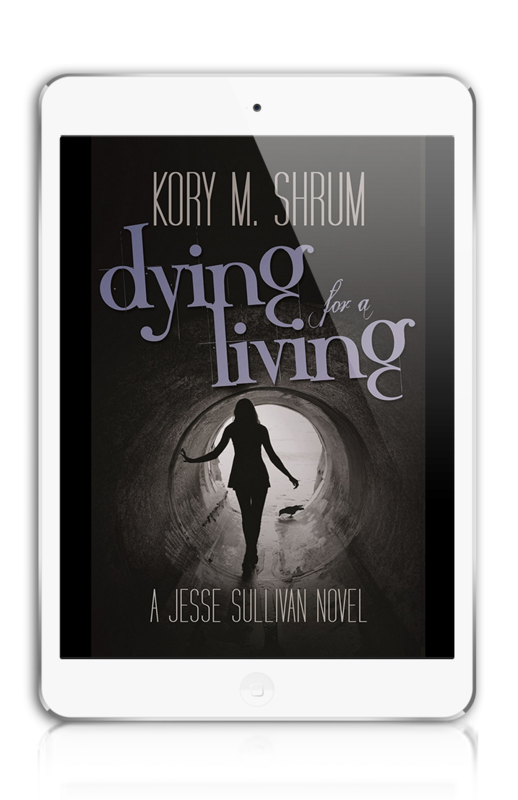 At the time of writing Dying for a Living is free at some online ebook retailers. Cover image courtesy of author Kory M. Shrum.